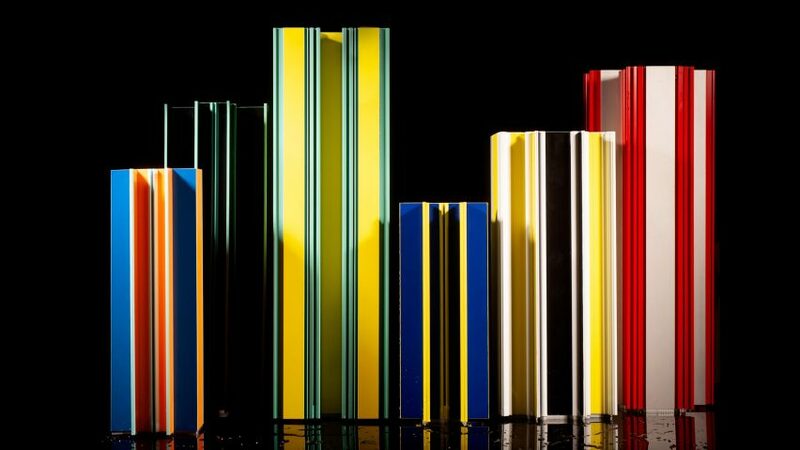 Madrid designer Jorge Penadés has repurposed extruded aluminium parts from old lamps and shelves to create a series of multicoloured vases for furniture brand BD Barcelona Design. Called Pisces, the limited-edition collection consists of six fluted vases with geometric structures and exposed joints. Presented next week at Salone del Mobile, which takes place during Milan design week, the vases feature bright, contrasting colours, inspired by coral reef fish in the Mediterranean sea. "I was born in the small fisherman's village of Málaga in Andalucía, and my parents live one minute away from the sea, so I grew up literally on the beach," Penadés told Dezeen. "Since BD Barcelona Design is based in Barcelona, I thought that the Mediterranean sea was something that we both shared and therefore we could use as a source of inspiration for the project," he explained. BD Barcelona Design supplied the designer with aluminium parts left over and dismantled from its discontinued products. Penadés used a laser-cutting machine to divide the aluminium profiles longitudinally and reconfigured them using thin, double-sided tape, before securing with glue. Each piece in the series sees the extruded aluminium parts arranged into one of three configurations. "The shapes came from the exercise of rearranging the different parts together," he said. The Spanish designer often uses repurposed materials when designing products. His Structural Skin table is made of shredded leather and natural bone glue that has been moulded together. Pisces will be on show at the Salone del Mobile furniture fair, which takes place between 9 and 14 April 2019. Also on show at Milan design week is an exhibition presenting the work of 21 designers and craft makers from Norway and a micro home that can be configured into 20 different layouts. Japanese designer Rikako Nagashima will also be exhibiting an abstract curtain collection for Kinnasand that addresses the problem of waste. Photography is by Gera Mena.